Adaptrum TVWS radios were deployed across these islands to assist in the relief and recovery effort. In late 2017, Hurricanes Maria and Irma left many islands of the Caribbean including Puerto Rico and US Virgin Islands devastated and with minimal surviving infrastructure including power and communications. 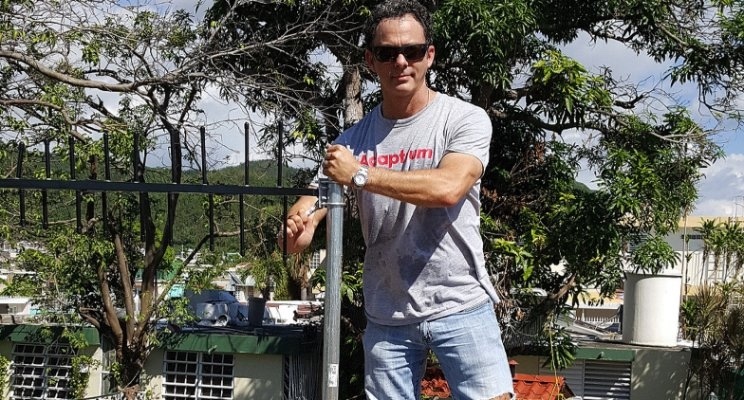 Working with Microsoft and NetHope, an NGO that specializes in improving IT connectivity among humanitarian organizations in areas affected by disaster, Adaptrum TVWS radios were deployed across these islands to assist in the relief and recovery effort. Given the lack of reliable power across the islands, Adaptrum radios were set up using solar power. As a result, TVWS brought connectivity to disconnected communities, schools, libraries, and clinics across the affect area. These sites also serve as internet hotspots where people in the community can come and connect with their family and friends. In the first deployment of TV White Space in the middle east, Adaptrum and Oman Broadband Company (OBC) completed a successful pilot in Muscat, Oman. The pilot project provided long-range internet connectivity to schools and residences, and demonstrated the ability of the technology to provide non-line-of-sight (NLOS) long-range coverage across the wide spread hilly terrain and scattered buildings of the area. Following the positive results of the pilot, OBC is looking ahead to a nationwide rollout of TVWS technology in order to support its mission of rolling out broadband infrastructure to deliver universal internet access throughout Oman. “The combination of coverage and capacity, delivered by TVWS Technology using Adaptrum’s solution, enables us to extend the reach of our broadband infrastructure especially for remote and rural areas,” said Oman Broadband CEO Eng. Said Al-Mandhari. Last-mile TVWS connectivity is bringing the internet to those who need it most — in Malawi, C3 and Microsoft are using TVWS to bring new opportunities to the 28,000 residents of the UNHCR refugee camp at Dzaleka in Malawi. The affordable access is enabling better communications for residents and access to learning. The deployment marks the first of C3’s planned nationwide rollout of TVWS to serve the many NGO’s operating across Malawi. To support that initiative, Adaptrum and C3 has also partnered with NetHope to provide training to NGOs on why and how to deploy TVWS to provide connectivity to their operations. In the mountains of Colombia, Adaptrum & Microsoft have launched a TV White Spaces project to bring Internet to the remotest parts of the country. Far beyond where fiber can economically be deployed, the project initially provides connectivity to remote schools in the village of Rio Arriba in the municipality of Aguadas, Caldas. For the 135 students there, the TV White Space solution enables access to new content and the ability to connect with other students; for teachers, it allows them to take advantage of new online tools and ideas. Nicknamed “bamboo Internet” after the six-meter tall bamboo pole where the antennas are mounted, the new TV White Space Internet connection is already helping improve classroom experiences in Colombia. “This will revolutionize education in Colombia! This is the country we want to build, in peace, equity and better educated,” said Juan Manuel Santos, President of Colombia. In collaboration with USAID, Microsoft, and Jamaica Universal Services Fund, Adaptrum launched an island wide project in Jamaica to provide Internet access to rural schools, libraries, healthcare clinics, and police stations in communities never before connected to the Internet. The project was proposed by USAID in support of President Obama’s Broadband Partnership of the Americas to provide faster Internet to more communities, especially in rural areas. In Jamaica primary schools, the pilot is transforming the way teachers teach and students learn. “Getting Internet access in rural communities in the Caribbean, and even worldwide, has always been a challenge for Internet service providers,” shares Vinni Jonas, Microsoft Technical Evangelist, West Indies. TVWS technology from Adaptrum now makes it possible to deliver Internet access to such rural locations. Scottish Enterprise partnered with the Mountain Bike Centre of Scotland to equip Glentress Forest with cutting edge Adaptrum TV White Space technology that will allow live coverage of the TweedLove Enduro World Series mountain biking tournament in Scotland. The rural area of the event historically suffered from having no or poor connectivity. With TV White Space, live video of the events could be streamed, and participants and spectators could get online to share their experiences with the world. “We can see how this clever new technology could hugely improve both the spectator experience and improve their time at centres such as Glentress,” said Danny Cowe, from The Mountain Bike Centre of Scotland. Near the town of Nanyuki, Kenya, Adaptrum, in partnership with Microsoft and Mawingu Networks, deployed the first TVWS network used together with solar-powered base stations to deliver low-cost broadband to rural areas that do not even have electricity. Adaptrum radios use white space spectrum to distribute wireless Internet access to WiFi access points that typical consumer devices can connect to. TVWS Offering a stronger signal than other wireless Internet delivery methods, TVWS is capable of traveling longer distances. The Kenyan deployment now connects eight customer locations, five schools, the Laikipia County government office, Laikipia Public Library, Red Cross and the Burguret Dispensary healthcare clinic. Gakawa Principal Beatrice Ndorongo reports that in the two-and-a-half years since the connection was established, students at Gakawa Secondary School have improved their scores in every single subject on the Kenya National Exam. In Botswana, Adaptrum technology is helping hospitals and clinics bring Internet connectivity over a TVWS network to enable remote diagnosis and support local healthcare service delivery. In partnership with Adaptrum, Microsoft and the Botswana Innovation Hub, Project Kgolagano is focused on providing access to specialized maternal medicine to improve the lives of women. The network is also being used to deliver educational applications to schools in remote communities. “Through Project Kgolagano, we will be using TVWS technology to provide access to specialized telemedicine applications, where hospitals can send high-resolution patient photographs back to Gaborone and Philadelphia for a more accurate diagnosis and care,” said Dr Geoffrey Seleka, director of the BIH Marketing, ICT, and Registration. Adaptrum, Microsoft, and the Indian government launched a program to connect five schools to the Internet within a radius of 10 km in remote rural and tribal areas of Srikakulam, India. The project launched with the installation of the first base station at the Kasturba Gandhi Girls Residency School. India faces a significant hurdle to narrowing the digital divide with just 19 percent Internet penetration in the country. With its greater geographic reach and low cost deployment, TVWS is an excellent alternative for connecting rural areas in India. “I am convinced that TV White Space can be the affordable answer to last-mile connectivity challenges in India,“ Bhaskar Pramanik, Chairman, Microsoft India. The Port of Pittsburgh Commission selected Adaptrum to deliver broadband wireless services to the U.S. inland waterway system with over 130 miles of seamless connectivity. This Wireless Waterways Connectivity project provides broadband connectivity to boats and barges throughout the rivers and waterways surrounding Pittsburgh to enhance waterway safety, transportation efficiency, and overall regional economic competitiveness. Two Adaptrum base stations were deployed on the rooftop of the Carnegie Science Center to connect boats on the Monongahela, Allegheny, and Ohio rivers in Pittsburgh. Using Adaptrum’s ACRS2.0 technology, the project demonstrated how TV White Space can effectively connect vessels travelling at different speeds to enable VoIP services and video calls. The project displayed successful TV White Space handovers when the client boats went from one TV White Space cell to another TV White Space cell. Excellent NLOS coverage spanning several miles on all three rivers further highlights that the technology is a critical element in creating wireless waterways. West Virginia University (WVU) became the first educational campus to leverage TV White Space (TVWS) technology to extend the reach of Internet connectivity. Using FCC-certified Adaptrum TVWS radios, WVU connected stations of their elevated “personal rapid transit” (PRT) system in order to provide WiFi coverage. With some stations located several miles from the main campus, extending Internet connectivity over the rolling terrain and through buildings and trees was not economical before TV White Space.